In October I participated in a Clinical Applications training in Colorado. We were 6 students, two teachers, and we worked on each other and clients for 5 days. At the end of the class I passed my final test for Techniques Certification. I am now the first Upledger Techniques Certified CranioSacral Therapist in Missoula! When someone asked Dr. John Upledger what CranioSacral Therapy ultimately is all about, his answer was: "Self-realization." Later he was asked why he persisted in publishing and teaching his ground breaking techniques despite massive and vitriolic resistance from the medical establishment. He had a very successful private osteopathic practice and did not need to expose himself to attacks and ridicule from his peers. To this he responded that this work is a way to World Peace. He was willing to face the storm of opposition because he saw the greater picture as more important than his own comfort. So how are Self-realization and World Peace related to one of so many manual therapies? There are countless paths to Self-realization. All of them ultimately lead us to the Divine Within. As long as we seek answers and direction from an outside authority, we are not free and authentic in our being. There is a necessary growth period that requires a follow-the-leader attitude. Young children and young souls do not have the experience and maturity to be entirely Self-directed. Before we can find enlightenment, we have to learn to tie our shoe laces. That is the time our ego or survival-self develops coping strategies to deal with life's challenges by focusing on survival, pleasure seeking, or pain avoidance. Eventually, some of us have matured emotionally to a point where the continual ego growth has reached its limit. Now it is time for a quantum leap. Such a quantum leap is accompanied frequently by a breakdown of the internal and external structures of our lives. Health issues, financial challenges, loss of loved ones or break-down of relationships can be the first symptoms of a profound inner shift. What used to work simply does not work any longer. Our attempts to patch things back together once they start falling appart are usually simple postponement of the inevitable. We have to step into the unknown and let go of any illusion of control. The ego is outmatched by forces beyond our comprehension. Once we start to break down the eggshell ( or armored tank) of the ego, the Soul-Self makes its appearance. Step by step the ego has to release its fearful clutching of old "stuff" to make room for an entirely new way of being - the Way of the Soul. "Stuff" out there gives way to something luminous "In Here", which is in truth much more satisfying. This "In-Here" is called the Inner Wisdom in CranioSacral Therapy. 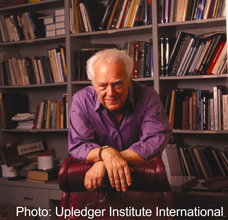 Dr. John Upledger called it the Inner Physician during his medical treatments. Absolute trust in this Inner Wisdom of the client and the therapist is a prerequisite for a CranioSacral Therapist. We have to make the shift from belief in outside authority to inside authenticity within ourselves before we can truly empower our clients to do the same. Like tying our shoe laces, we first learn manual techniques to assist the physical body in well defined steps. But eventually these techniques become tools in the hands of the Inner Wisdom. We learn to let go of control and give it back to the emerging Soul-Self, which is expressed through the body before the mind catches up. We re-learn the subtle language of the Soul as it communicates through intuition and subtle sensory impressions that become the staple of our treatment skills. Ultimately, we want for our clients to become fluent again in the language of their soul. That is Self-empowerment and Self-realization. And it does not happen in 6 weeks or 8 treatments. It is a gradual process where sometimes our assistance is needed, and often it is not. This shift to Self-realization is the most important step to World Peace, in whatever way it happens. Once we move from survival motivation and ego driven materialism to the guidance of Inner Wisdom, it gives us a sense of profound safety and belonging. Finally we have a chance to approach the "other" as another incarnation of Inner Wisdom without the need for competition. When we realize that all the resources we need have their origin deep within the Soul-Self, we will not need to fight wars over resources "out there". There is enough for everyone and then some. The Upledger teachers and their invaluable feedback remain in Colorado, but back home I found the best surrogate for my further training in my horse. When I approach her with too much intent on doing something to fix her, she backs away from me. But when I present myself and my hands to her in a completely neutral way without ego involvement, she moves into the perfect position to indicate where my hands are welcome to assist in her well being. Practice makes perfect. Actually there is no such thing as perfection, but the pursuit of it creates excellence. I'll settle for that.